Considered the most prestigious sports car race in the world, the 24 Hours of Le Mans is an event victory equally desired by drivers and auto manufacturers. One of the few venues where greats in auto racing drivers can pilot the newest in automotive technology prepped for motorsports. Bio-fuels, hybrid powerplants, and the radical super-lightweight DeltaWing race car have been brought to the Circuit de la Sarthe for the 2012 edition of the day-long competition. With a unique field of prototype race cars and a slew of diverse GT cars, qualifying for the 2012 24 Hours of Le Mans would be an interesting occasion to sample who could be the front-runners for the Saturday afternoon through Sunday race. 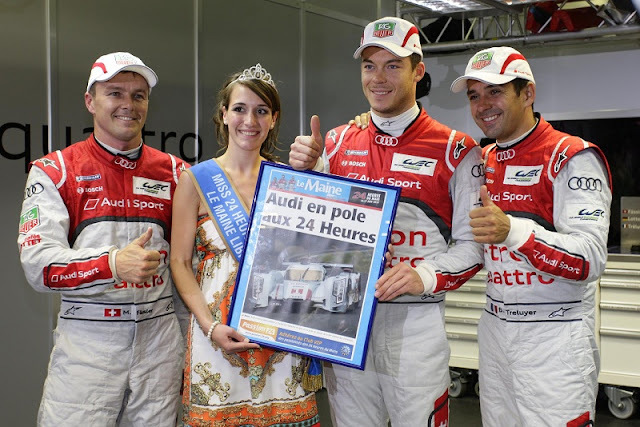 Claiming the first-ever pole for a hybrid prototype sports car for the 24 Hours of Le Mans, the Audi R18 e-tron quattro was the vehicle that prevailed for the glorious front row starting spot for Saturday's day-long endurance event for LMP1. The #1 Audi R18 e-tron quattro shared by Marcel Fässler, André Lotterer, Benoit Treluyer took the top place by a slim 0.291-second advantage over the teammate #3 machine running the conventional TDI only R18 Ultra package. The lead Audi R18 e-tron quattro was a second faster than the competing LMP1 brand competitor. Returning to the 24 Hours of Le Mans for the first time since 1999, Toyota debuts the TS 030 Hybrid prototype at the Le Mans race in a continuing pursuit for a first overall victory at the French event. The #8 Toyota featuring the driving combination of Anthony Davidson, Sébastien Buemi, Stéphane Sarrazin will start on the second row of the 24-hour race alongside the second Audi e-tron quattro. Leading LMP2 in the 14th overall position, the #25 Oreca-Nissan starts 0.417 seconds ahead of the #24 Morgan-Judd. Lighter cars than LMP1 with smaller engines, the LMP2 class is often known to be the most difficult category for competitors to finish making the endurance component of 24 hours very pivotal to the victor of this class. The most wide open GTE category at the 2012 Le mans 24-hour race features strong professional efforts from Ferrari, Chevrolet, Aston Martin and Porsche. The #59 Luxury Racing Ferrari 458 Italia took pole in the GTE class by 0.477 seconds over the #97 Aston Martin Vantage V8. Little more than half a second off the pace of the fastest Ferrari, the Corvette Racing group's #74 ZR1 sports car has sights set on reclaiming the GT class victory at the Le Mans race. Running the race as an experimental entrant, the DeltaWing powered by Nissan was 29th fastest in qualifying outpacing four LMP2 cars. Presenting a 56-car field, the 24 Hours of Le Mans is set to start at 3pm local time.